It is good to be the points leader. Just ask Shane Huffman. 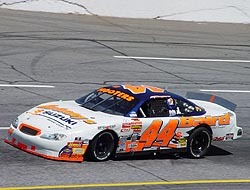 By virtue of being the points leader in the Hooters Pro Cup Southern Division, Huffman was able to run a conservative race. 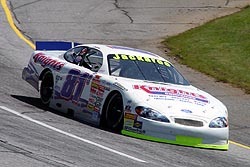 All the while, Huffman’s biggest rival, defending Pro Cup champion Clay Rogers, ran a race with a different agenda. 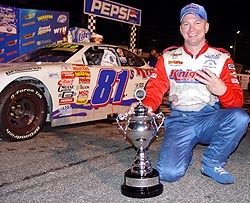 Huffman, who really wasn’t a factor most of the night, shot to the lead out of nowhere on lap 223, past Rogers, and cruised to the finish to earn his third race win in four events of 2005. Huffman spent most of the night just hanging around the end of the lead lap while others fought and traded the lead. Huffman did it during the first run and then again after the pit stops. That was until about 50 laps to go, when Huffman decided that he’d laid back and saved enough, and started his march to the front. With just over 25 laps to go, Huffman had moved from ninth to the lead, and he never looked back. It was the equivalent of a great “poker face” on the race track. Well, the different agendas led to different results for each driver on Saturday night at Peach State Speedway (Jefferson, GA) as the Pro Cup cars had their fourth event of the year. Rogers went into the night knowing he wanted to lead laps, lead the most laps, lead half way and win the race, all to get the most points possible to help gain on Huffman. Huffman knew that with two wins in the first three races of the year, he had the ability to lay back and save his stuff to the end, not worrying about points racing. It worked out in Huffman’s favor. 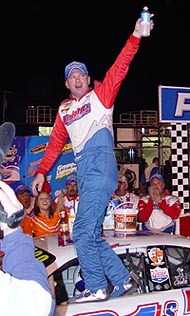 “That was an interesting race,” said Huffman, shaking his head in amazement in Victory Lane. “We got on that real long run at the end of the first half and I was I wasn’t running real hard, but I was spinning the tires. By the end of that first half of the race, we were off two seconds or more. “After the pit stop, there wasn’t but only nine cars on the lead lap. I told the (crew) guys ‘we are just going to sit here and we’re going to let the leader catch us.’ I said ‘we’ll stay just about a half-straight ahead of the leader and we’ll just ride.’ We were going to save all we could and hope that it would pay off for us at the end of the race. No one paid much attention to Huffman for most of the race. All eyes were focused on Rogers, Shane Wallace, Toby Porter and Mark McFarland, who were the front runners much of the night. But by the end of the night, everyone knew Huffman was coming. We've seen this before... Huffman climbing out and waving to the crowd after a win. the first 10 laps of a run seems to dictate how they will treat you the rest of the run. So I was real careful to not spin a tire the second half. It paid off for us at the end of the race. Everything worked out in our favor. Rogers thought he had the best car, but he was one that never wrote Huffman off. “Tonight, we were just on a different agenda than Shane,” said Rogers. “I wanted to get to the lead and lead a lap for the five bonus points. So I thought I was really going to ride for the second half of the race. I wanted to lead halfway for those bonus points. We are points racing. “So the lap after halfway, we feel off about half a second. We were still able to maintain the lead for a couple of laps. I tried to save my tires as much as I could. I was backing off just past the flag stand. I was letting off way early. The car was rotating through the center of the corner so well. I was just rolling and putting the power down. All of a sudden, the car just went away. For most of the race, Roger's #44 was the car to beat. “I never would have imagined that you would have to ride that slow to save your stuff,” added Rogers. “At one point, we were leading the race running high 19s and low 20s. He is sitting back there running high 20s. That is two seconds off the qualifying speed. “He drove a smart race. We did what we had to do though because we needed bonus points. He did what he had to do. He could do that by being the points leader. Once in the lead, Huffman cruised to the finish to earn an impressive third win in just four races. He’s on a roll and he knows this. “I can’t believe this,” added Huffman. “Things are just gong our way. We are going to ride it while it lasts. You just never know how long it is going to last. Everything is just going our way right now. While it is my turn, we are going to capitalize it. racing with one car. If something were to happen, we would be way behind. But these guys are working really hard on this whole operation. I can’t ask anything more of anyone. Randy Gentry finished a distant third, with Jay Fogleman, who made up a lap under green, finishing fourth and rookie Michael Faulk fifth. RIght now, no one can beat the #81.